Click on each project/tab to read more! Recent presentations and publications from projects are included. Former REU student co-authors are italicized. Dr. Tina Collison (Chemistry) is reinventing organic chemistry lab instruction through the creation, implementation, and evaluation of Reformed Experimental Activities (REActivities) based on evidence of how students learn. Data is currently being collected at several institutions with varying characteristics (large/small, public/private, 2-year/4-year) in order to evaluate meaningful learning in the laboratory, and fidelity of implementation. Dr. Collison and team are investigating how students learn from these reformed laboratory activities. Jackson, Matthew; Amezcue, Fidel; Marmor, William; Kipsang, Rodgers; Goudreau Collison, Christina; “Reformed experimental activities (REActivities): Design, implementation, and evaluation of a novel organic chemistry lab delivery at both four-year and two-year institutions” Abstracts of Papers, 254th ACS National Meeting, Washington, DC, United States, August 20, 2017 CHED-200. Dr. Kate Wright (Biology) and Dr. Dina Newman (Biology) are investigating how bringing physical models of biomolecules into biology classrooms improve conceptual understanding of structure-function relationships that drive biological phenomena. Our recent work has shown that physical, interactive models of genetic information flow help promote conceptual change in biology students. We are currently working with colleagues at the Center for Biomolecular Modeling (Milwaukee School of Engineering) to create new materials to accompany model-based activities that teach students about chromosome structure and behavior. Physical Models Can Provide Superior Learning Opportunities Beyond the Benefits of Active Engagement. Dina L. Newman, Megan Stefkovich, Catherine Clasen, Margaret A. Franzen and L. Kate Wright. Biochemistry and Molecular Biology Education. In press. Dr. Dina Newman (Biology) and Dr. Kate Wright (Biology) investigate how students interpret and understand canonical representations in cellular and molecular biology, focusing on the inability of students to identify, construct, and utilize scientific representations. Much of the previous work on how students use graphical representations has focused on identifying misconceptions, but the impediments to student understanding appear to be the result of fragmented or inaccurate conceptual knowledge, faulty mental models, and an inability to translate between different conceptual models or representations. Past work has shown that and typical representations do not prime students to think about molecular mechanisms associated with information flow and exchange. Wright and Newman are also collaborating with biomedical illustrators to articulate and test new design principles for biology symbolism. Dr. Dina Newman (Biology) and Dr. Kate Wright (Biology) are interested in how a newly developed framework, called the DNA Triangle, can be applied to learning and instruction about important topics in biology that center on DNA (genetic information flow, Meiosis, etc). The DNA Triangle Framework integrates three distinct scales at which one can think about DNA; chromosomal, molecular and informational. Using the framework recent work revealed differences in how experts and novices (biology learners) think about Meiosis-related topics and how college-level textbooks often fail to make the molecular level explicit to students. We are interested in applying this framework to scientific representations, models, instructional activities and assessments to better understand how information is presented to learners. We are also interested in developing new conceptual frameworks that help educators and researchers understand how topics such as gene expression are convey to and understood by learners. Dr. Kelly Martin (Communications) and Dr. Benjamin Zwickl (Physics) collaborate on the Photonics and Optics Workforce Education Research (POWER) project which explores the photonics workforce and how entry-level employees transfer their knowledge of math, physics and communication into their entry-level jobs. 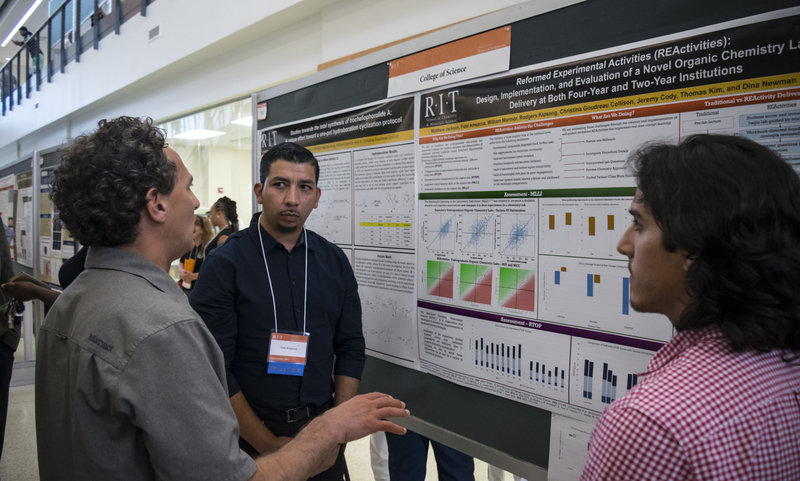 Previous REU projects have studied problem-solving among PhD student researchers in physics, computational and analytics math use among PhD research students, math use in optics companies, and optics skills and knowledge used in optics companies. Former REU students helped the team analyze interviews with 33 employees at 15 optics and photonics companies about communication norms and expectations in their workplaces. From these interviews we identified five prevalent themes related to what optics and photonics employees consider competent communication. We also defined the term cross-occupational communication: an interactive, iterative process involving communicative needs assessment, information exchange, and rhetorical/situational flexibility with groups distinct in background, training, and occupational role. As a result of these findings, and as part of the larger research group, we argue for systematic and intentional communication in the disciplines instruction that considers cross-occupational communication needs in the workforce. Read more about this work at Spewing nonsense [or not]: communication competence and socialization in optics and photonics workplaces. Kelly Norris Martin, Amy L Gaffney, Anne E Leak, Jes Nelson, Alexandria T. Cervantes, Katherine Louise Gardener, Brandon L. Clark, & Benjamin M. Zwickl, Communication Education, 67, 414-437 (2018). Dr. Kelly Martin (Communications) and Dr. Benjamin Zwickl (Physics) also conduct the Exploring Multiple Postsecondary Opportunities through Workforce and Education Research (EMPOWER) project on the cultivation and use of 21st Century Skills such as problem-solving, collaboration, communication, and self-regulated learning, in STEM classrooms and workplaces. The study spans multiple STEM fields and REU students will be involved in projects investigating workplace practices in order to guide changes about how and what we teach in STEM courses and also to support policymaking around workforce development issues in STEM. Current research is focusing on problem-solving and communication. For example, the team is comparing problem-solving practices across disciplines (computing, photonics, energy, nursing) and differences between professional practice and academic preparation in problem-solving. The project has implications for how disciplines, such as physics, teach problem-solving in their large enrollment introductory courses, which serve a diverse range of majors. Dr. Ben Zwickl is part of the education research team on the American Physical Society PIPELINE Network, which is focused on improving career, entrepreneurship, and innovation education within physics departments. The research is currently focused on understanding physics majors’ perspectives and experiences regarding seven dimensions of innovation and entrepreneurship: creativity, design, leadership, business, communication, social impact, and technology. These perspectives reveal what knowledge and expertise is explicitly or implicitly valued and considered part of physics. The team is interested how these views evolve as students progress through their major and how these views might affect who participates in our physics community. Dr. Lindsay Owens is part of the research team (including Dr. Casey Miller, Dr. Ben Zwickl, and Dr. Scott Franklin) focusing on holistic graduate practices in physics. The research is currently looking at (1) the relationship between holistic admissions practices and their implications for diversity in graduate cohorts and (2) the relationship between holistic on-boarding and departmental practices and their implications for retention. The team is currently interested in studying the differences between faculty’s and graduate student’s perspectives in regards to holistic practices. For example, which practices do faculty and graduate students value? Further, are they valued equally between faculty and graduate students? Current physics education research by Dr. Scott Franklin (Physics) focuses on the meaning students and faculty give to mathematical representations. Conceptual meaning in physics is often expressed through mathematical formulae, and the meaning associated with symbols highly dependent on context. Symbolic forms are elemental relations associated conceptual schema with mathematical symbol, and articulate the conceptual and contextual meaning embedded in complex mathematical equations. Forms are context-dependent: two equations that are mathematically identical may have very different physics meanings. This research seeks to identify how the concept is embedded in equations and identifying new forms appropriate to advanced topics. Sample projects have included analyzing textbooks at all levels for different uses of equal signs ("="), studying an intermediate mechanics lecture that derived the amplitude of a driven harmonic oscillator, and parsing instructor language in a senior-level fluid mechanics lecture on conservation of energy and the Reynold’s Transport Theorem. Dr. Jennifer Bailey (Biomedical Engineering), who is a new project mentor, is developing hands-on laboratory activities that incorporate Design Thinking and Spatial Visualization (SV) skills into the Biomedical Engineering freshmen curriculum. Design thinking and SV are aspects of modeling that represent important skills for engineers, and possibly all STEM students. Dr. Bailey’s project will allow REU students to help develop activities and assessment materials to measure the impact of introducing these skills early into the engineering curriculum and how these topics can be effectively intertwined. Dr. Scott Franklin (Physics) supervises research on undergraduate student metacognition, including accuracy of self-assessment, reflections on one’s own learning, and how students choose and design experimental investigations. The focus of this research is often a 2-week experience for incoming 1st generation and/or deaf/hard-of-hearing STEM majors in which students engage in activities designed to encourage metacognitive reflection about knowledge and personal identities that affect learning. Research students have analyzed artifacts of the Integrating Metacognitive Practices and Research to Ensure Student Success (IMPRESS) program from prior summers and taken new data on that year’s cohort for evidence of how metacognition effects disciplinary learning. Benjamin Archibeque, Mary Bridget Kustusch, Florian Genz, Scott Franklin, Eleanor C. Sayre. Transforming Learning, Empowering Learners: The International Conference of the Learning Sciences (ICLS) 2018. London: International Society of the Learning Sciences. We investigate the utility of two qualitative measures of equity. Our data are videos of groups of first-generation and Deaf or hard-of-hearing students in a pre-matriculation university program designed to help them persist in STEM fields by developing their metacognitive practices. We analyze video data of students in small groups trying to accomplish various tasks. We analyze how groups engage with proposed ideas (inchargeness) and create a space of open sharing (civility). By capturing different aspects of each group, these measures combine to help our understanding of what an equitable group could look like. This project investigates how to quantitatively measure equity in small student groups in classroom settings. We follow several student groups to operationalize equitable discourse. Three methods were developed to operationalize and measure equity: 1) simple speaking time (who talks, when, and to whom); 2) consistency of discourse (are the same groups of people consistently speaking); 3) group equality over time. While various pedagogical techniques exist to encourage student reflection, little research has examined the differences between formally guided, partially guided and unguided reflections. This study focuses on student responses to online Guided Reflection Forms (GRFs) from students in a first-semester non-physics class and, separately, a sophomore-level Vibrations & Waves course for physics majors, and compares these guided reflections with partially guided and unguided journals from a STEM enrichment summer program for incoming college students. A previously developed coding scheme was used on guided reflections and the LIWC computational linguistics tool used to confirm the distinct nature of the categories. Both guided and unguided reflections elicit metacognitive and reflective practice, although of measurably different frequencies and kinds. Bertram, C., Leak, A., Sayre, E. C., Kustusch, M. B., & Franklin, S. V. In Looi, C. K., Polman, J. L., Cress, U., and Reimann, P. (Eds.). Transforming Learning, Empowering Learners: The International Conference of the Learning Sciences (ICLS) 2016, Volume 2. Singapore: International Society of the Learning Sciences. We report on student beliefs about what constitutes expertise. Our population is a group of first-generation and deaf/hard-of-hearing students participating in a pre-matriculation university program designed to encourage reflection and metacognitive practice. Students first worked in small groups to articulate criteria that defined expertise and then engaged in a class discussion in which a formal definition was developed. All activities were recorded and student discourse analyzed, revealing a nuanced and evolving understanding of expertise.